Summer heat waves are around the corner, and so to are baskets of sweaty, smelly laundry. Scientists at UC Davis have invented a fabric that may help to combat the perspiration problem with a new fabric that acts in a similar fashion to human skin. Excess moisture forms itself into droplets and drain away along the material. The textile consists of a microfluidic platform that uses water attracting threads stitched into a water repellent fabric. 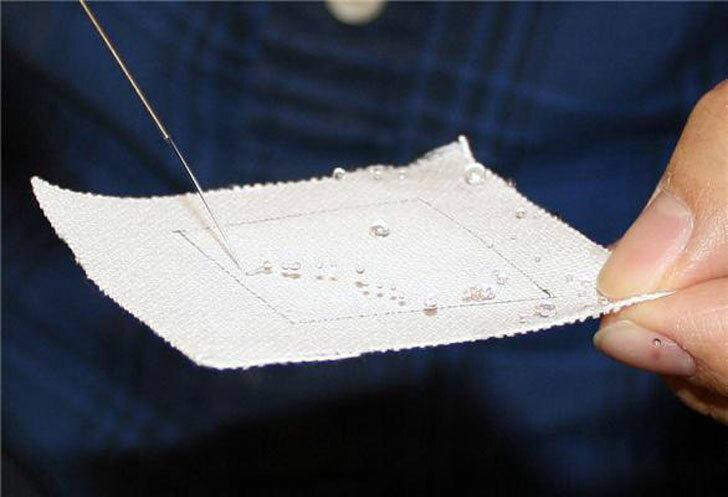 The researchers were able to collect water via the threads on one side of the fabric and move them along to the other side, expelling the moisture. The threads use capillary action to move the water as well as taking advantage of the water repelling properties of the surrounding fabric to channel the liquid. The process continues to work even when the fibers are completely saturated due to the sustaining pressure created by the surface tension of the water droplets. The remaining part of the fabric remains dry, and by adjusting the pattern of the moisture-absorbing fibers, the researchers are able to control how sweat is drained, moved, and collected. The scientists stated that they intentionally did not use any “fancy microfabrication techniques” when developing the textile in order to make it easier to produce on a market scale. Soon, unsightly patches of underarm sweat and gym towels could be a thing of the past as technology begins to combine with functional fashion.